New camera can see through your body Scientists have developed a camera that can see through the human body. Every year it feels more and more like we are entering the age of what we imagend it would be like, well at least the technology part of that statement. Now they have created a camera the can look directly through you and see specific selected images of you! Until now, medics have had to rely on expensive scans, such as X-rays, to trace & map your insides. 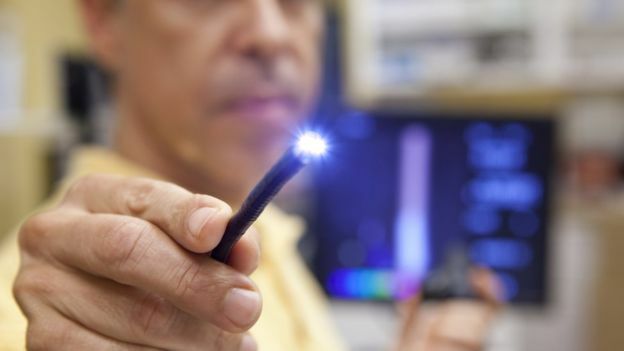 The new camera works by detecting light sources inside the body, such as the illuminated tip of the endoscope’s long flexible tube. Early tests have shown the prototype device can track a point light source through 20cm of tissue under normal conditions. Beams from the endoscope can pass through the body, but usually scatter or bounce off tissues and organs rather than travelling straight through. The new camera can detect individual particles, called photons, and is so sensitive it can catch tiny traces of light passing through tissue.It can also record the time taken for light to pass through the body, meaning the device is able to work out exactly where the endoscope is.